Communities of all sizes are actively preserving waterfront space for public use. Beaches and waterfront parks are a versatile and robust asset, valued for their beauty, their role in providing shoreline habitat, their cultural and recreational opportunities, and as a threshold – and potential barrier – against rising sea levels and storm surges. Balancing these different uses is important – and enables a diverse array of patrons to enjoy the space while ensuring that a variety of other functions are maintained. It’s amazing that these natural spaces can play host to so many different activities: a place families and friends to gather, a venue for large events (eg: concerts, festivals or fireworks), small scale team sports and tournaments, bird watching, swimming, sailing regattas and dragon boat races, picnics, people watching… the list goes on and on. Vancouver has a long tradition of securing waterfront space for new parks – by purchasing land for new parks, through the development process (where greenspace is achieved in exchange for development rights), and also through advocacy from community groups (CRAB park is a notable example here). In this article, we highlight two examples of prominent beachfront assets – one in Vancouver, and one across the Inlet in West Vancouver. Kitsilano Beach Park is one of the historic beach green-spaces in Metro Vancouver. It is known as Xwupxpay’em in the Sḵwx̱wú7mesh (Squamish) language. It was also, as part of the early settler history of the area, known as “Greer’s Beach” – after homesteader Sam Greer, who farmed in the area in the late 1880s. Around this time, in the mid to late 19th century, when transportation options were more limited, it was used for camping. (As a side note, you can read about Greer’s fight with the CPR to keep the property here). Once the street car was introduced to Kitsilano in 1905, the beach became a far more popular destination for Vancouverites. Initially, building on its earlier recreational use, it served as a “tent town” offering rustic camping – though that was discontinued owing to sanitation concerns. As the area became more settled, a greater array of conventional park amenities were added over the years – including, in 1931, the famous Kits pool (the largest open air pool in North America). Decades later it was used as a training ground for Canadian soldiers, shortly before D-day – during the Second World War. Today, Kits Beach offers a myriad of activities and amenities: tennis and basketball courts, a swimming raft with lifeguards from May to September, the aforementioned outdoor pool (recently refurbished), outdoor stage, and path to a dog friendly beach – all connected by the Seaside Greenway. Another feature is the accessible playground, that is fun for all ages, and an excellent addition to the surrounding community. A full-service, though privately run, restaurant and concession stand offers the opportunity to enjoy a drink or meal, soak in the sea breeze, and do some people-watching. Moreover, Kitsilano Beach is actually part of a long ‘necklace’ of greenspaces that stretch further east (along the Seawall to Vanier Park) and west (along the Seaside Greenway, past a series of smaller neighbourhood parks, to Jericho and Locarno Beach parks at the west end of the city. For all its popularity – or perhaps as a result of it, Kits park has had its fair share of controversies over the past few years. In 2010, the relocation and development of the playground faced opposition from users who wanted to keep it in a quieter and more shaded location, further north in the park. 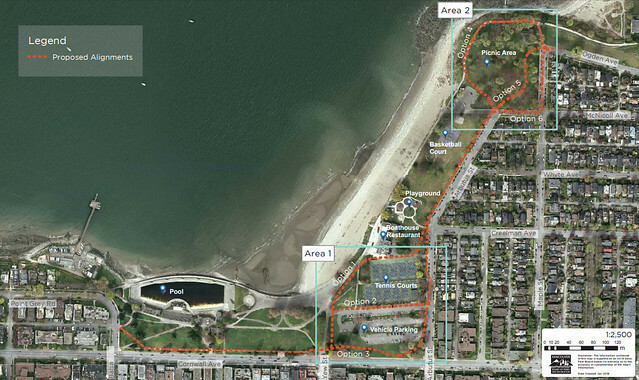 Most notably, there is an ongoing debate around cycling in and adjacent to the park – which first emerged in a 2013/4 proposal (and subsequent revisions) to connect the Seaside Greenway (and seawall) through Hadden Park, to the east, and into Kitsilano Beach park. More recently, other proposed improvements to cycling routes through the park have generated further debate. The current path is very busy, and has led to concerns about pedestrian and cyclist conflict, so options have been developed that would separate cycling and walking routes. However, when routing options were presented to the Park Board earlier this year, a majority of Commissioners voted to defer a decision on how to proceed. Finding the best final solution to the path design will be a balancing act between the needs of local residents and beach users requiring parking, bike path users, pedestrian safety requirements and green space retention. The preliminary Parks Board Design options can be viewed in the appendix to the Parks Board minutes. All of which shows that creating effective multi-use facilities – especially when they are to be located in popular destinations like Kitsilano Beach – can be a complex balancing act. Controversies aside, Kits Beach is a prime example of the richness and diversity that comes with well-designed beachfront parks. Its many different uses continues to attract people in large numbers. Little wonder that it is frequently cited as one of the best beaches in the world. Like Vancouver, West Vancouver has put considerable effort into creating attractive beachfront space, and recent planning work has further improved their network of waterfront parks. 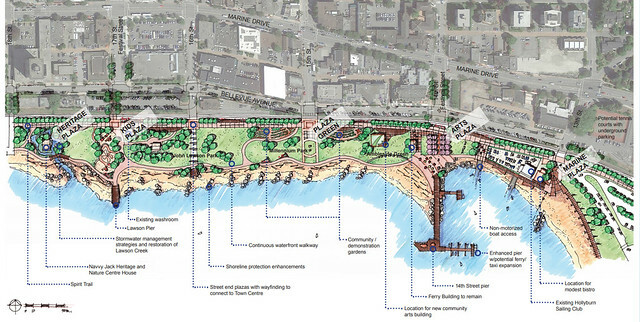 West Vancouver has created its own ‘necklace’ of greenspaces along the north side of the Burrard Inlet. Two larger parks, Ambleside and Dundarave, serve as larger destination anchors, while the space in between is home to smaller parks and spaces that include picnic tables, playgrounds, a waterpark, duck ponds, sports fields, basketball courts, tennis courts, beach volleyball, a pier, and a skatepark. A trail system provides a continuous walking path to link these areas together, running from roughly the Lions Gate Bridge, past Ambleside, and all the way to Dundarave. Additional beachside amenities include concession stands, showers, washrooms and parking. The Ambleside end of the park network also includes a 3.5 acre off leash dog area, with grassy meadows and water access. Large open spaces enable the park to serve as a venue for hosting major outdoor concerts and festivals. Travelling westward, you pass the sailing centre and old Ferry Building art gallery, before arriving at, first, Millenium Park, and then John Lawson Park. The latter offers: a children’s play areas, a spray park, and picnic areas. The pirate inspired playground was one of nine notable playgrounds, written about in the April 2016 edition of Today’s Parent Magazine. The park area is a multi-functional space that attracts young and old alike. For ten days every summer, it also hosts the Harmony Arts Festival, an extravaganza of art and food vendors. Renewal of this series of beach front spaces was undertaken in 2016, and initiated through the District of West Vancouver’s Ambleside Waterfront Concept Plan. 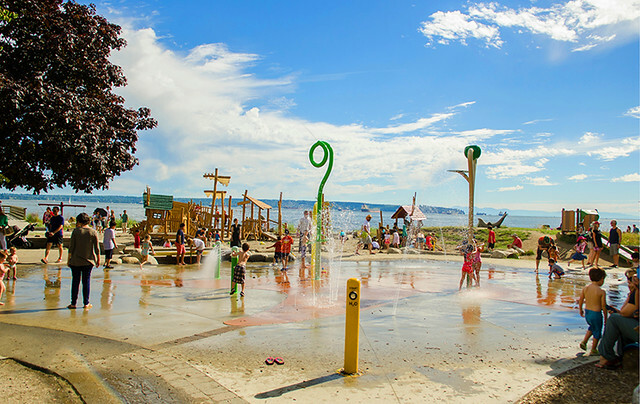 With concepts taken from the West Vancouver Official Community Plan, eleven guiding principles were created by the community and used to create a vision for the network of parks and beaches. Goals included: improving water access, completing the seawall walking path, increasing and renewing art spaces, respecting heritage, and including the sailing centre in the plans. The full concept plans can be seen here. The scale of this approach is sensible, helping the individual parks to be treated as part of a larger, interconnected waterfront system. By doing this, attention can be made to creating a connected waterfront ‘experience.’ In practical terms, the approach also means that important waterfronts are collectively enriched with new public amenities, the foreshore is retained, pedestrian and cycling facilities are enhanced, and other traffic conflicts in the area are reduced. The district of West Vancouver should be proud of its success, in improving beachfront assets and making them more vibrant. Anke Hurt is a recent graduate of the Langara Community Planning Program, a resident of Vancouver, and enjoys kayaking and walking on the Lower Mainland beaches.